Earth Day is coming up on Sunday, April 22nd, and my four-year-old is excited! We live in Northern California, which is a very Earth-friendly place to live, and my son has known about reducing, reusing, and recycling for a long time. We try and live like every day is Earth Day, but there are definitely some things we need to work on! One thing I have been thinking a lot about lately is the practice of precycling. Basically, precycling means that you reduce waste by avoiding bringing items into your home or business that will generate waste. There are a lot of ways that you can precycle (buy consumables in bulk, buy items with less packaging, use electronic media instead of buying magazines/newspapers, etc.). One way that we try and precycle is by using cloth towels in our home instead of buying paper towels. If we don’t have them, we don’t use them. It is something super simple, but we’re now at the point that if I have a paper towel my son looks at me cross-eyed and asks for a “regular towel.” He doesn’t want us wasting things and hurting the Earth. As part of a little Earth Day celebration we had with friends this week, we made freezer paper stenciled Earth Day towels so that each child could have their own special towel to use. 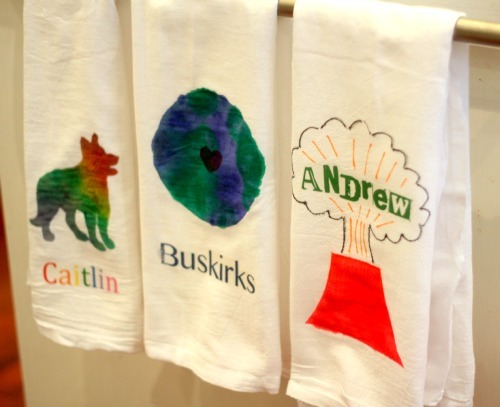 Each towel was personalized based on the child’s interest. This activity is pretty simple and you don’t need that many supplies. I did this activity with preschoolers, but it is really more appropriate for elementary age students. Preschoolers need a lot more help and guidance, though they still had a lot of fun! 1. Iron your towels before you get started. 2. Decide on the design you want to use on your towel and then create a stencil. 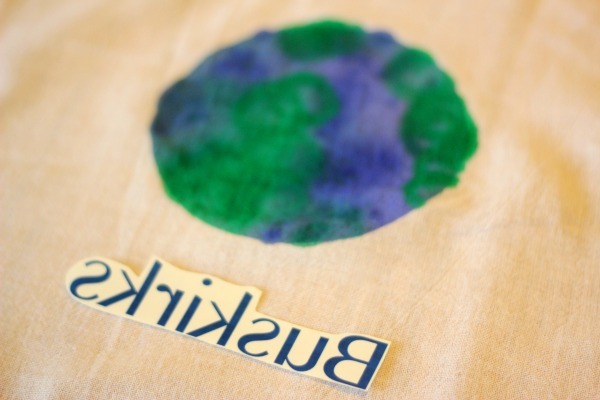 A simple example would be the Earth with a thumbprint heart towel that we created. I cut a circle out of the freezer paper to use as my stencil. For more complex stencils you can do a Google image search. There are a lot of free stencils online. Or you can make your own. Just remember, simple is better. 3. 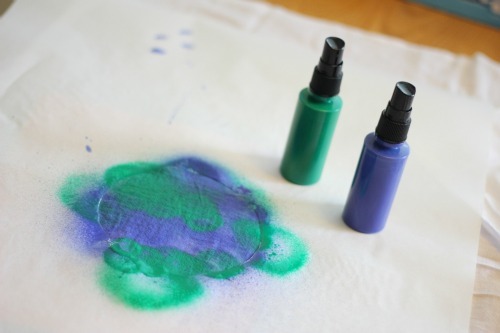 Iron the freezer paper onto your towel so that it is secure while you paint. With little kids I like to make sure that I cover a large area of the kitchen towel with freezer paper to protect the towel. 4. Put something underneath your kitchen towel since the color will bleed through. 5. Start painting! We used Tulip Fabric Spray Paint because it is quicker for little ones. 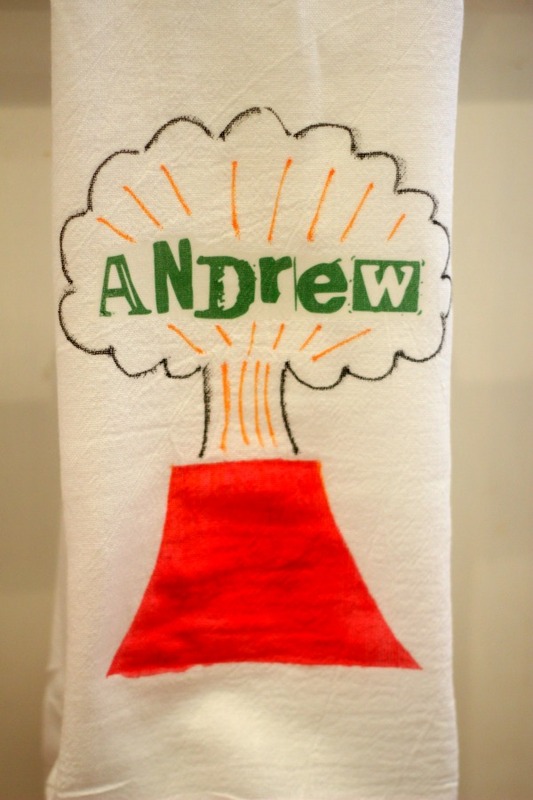 You could also use a brush or sponge to paint just regular fabric paint onto the towel. 6. Let the paint dry. It takes a few hours especially if your artist uses a lot of paint! 7. 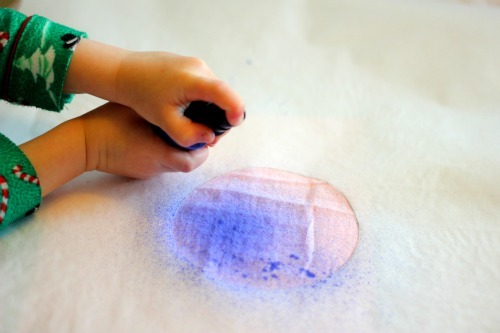 Once dry, pull off the freezer paper and put it aside to use for something else. Then you can add another layer of paint or some other details and repeat the steps above. We added a little thumbprint heart to the center of our Earth using red fabric paint. 8. 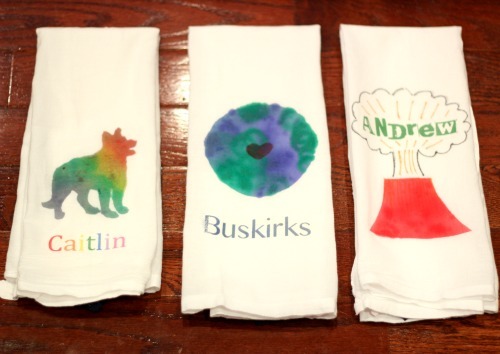 If you want to personalize your towel, print off your wording or any other designs onto iron transfer paper. Make sure that you make it a mirror image so that your name isn’t backwards. Turn the writing so that it is face down (opposite of the picture below) and then iron it onto your towel. Make sure you turn the steam off and your iron is dry. Hold the iron on the wording for several seconds and then let it cool before you pull off the iron on transfer. Everyone in our family got their own personalized towel based on their current favorite obsession. My son loves volcanoes and my daughter is a huge dog fan. My daughter was so excited about her towel (hers will be used the most because she is a very messy one-year-old!) that she just kept hugging it and giving it kisses. Obviously she thought the activity was a success!! Not only is the project good for being more earth-friendly, but it could also be a great Mother’s Day present for Grandparents or Aunts or a present for your child’s teacher for Teacher Appreciation Week. Homemade and personalized items that serve a purpose are always one of my favorite gifts to receive! Want to learn more about raising a child “green”? 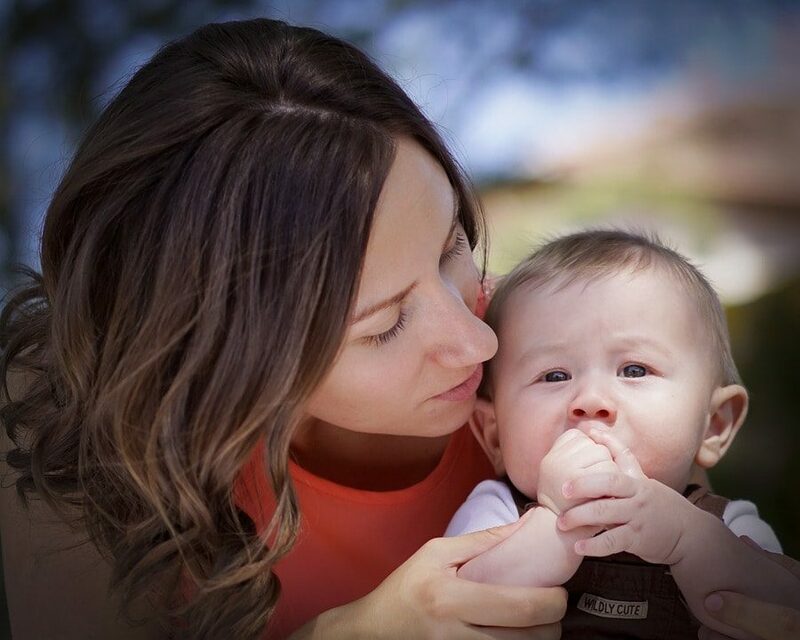 Check out Katie’s post about raising a child “green” with the power of words. I also shared 5 simple crafts made from reused materials over on Toddler Approved this week if you are looking for more Earth-friendly crafty ideas. Are you doing anything to celebrate Earth Day? Have you done freezer paper stenciling before? What would your child put on their towel? How do you make every day Earth Day in your home?